If the longer, warmer days signal one thing, like the start of grill season, here are the 13 indispensable guides full of BBQ tips to get you grilling like a guru in the months ahead. By applying a little science, some practical tips, and top quality ingredients you’ll find all the info you need on how to get the best cook whether it be steak, smoking, marinades, vegetables or cleaning down afterwards. Naturally steak is the king of the grill. This steak cooking fact sheet is an indispensable starting point for anyone serious about perfecting their meat. It offers scientific tips on how to cook the perfect steak as well as the ageing of meat and the impact it has on final flavour. While pefecting that perfect medium rare steak may feel more like an art than a science there are some basic principles you can apply when it comes to temperature and cooking time. This is a neat infographic that captures just that, offering up the correct temperatures for steaks, from rare to well done. Watch chef and author Adam Perry Lang as he offers up some tips on how to grill tastier meat. Enjoy the second piece of footage in Adam Perry Lang’s hands as he divulges more grilling techniques. Smoky flavour and BBQing go hand in hand. This infographic breaks down which woods produce the best flavour on the grill as well as what cuts of meats to use and the best sauces to marry them with. If you’re the nominated grill master in your house this is the one indispensable guide to everything from getting started with the right cuts, the simple finger test for well doneness, marinades and some easy hints on how to clean up afterwards. 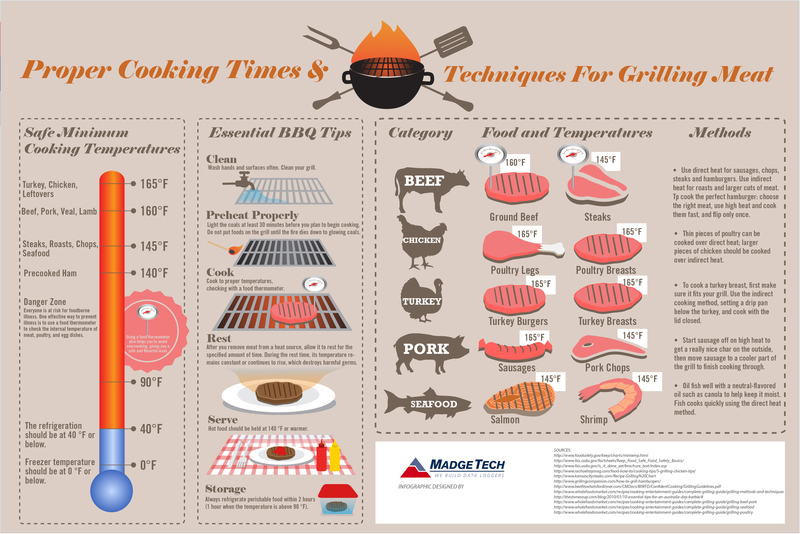 Cut out the guess work on grilling time with this handy infographic that covers some of the most popular grill foods from meat and seafood through to vegetables. Just make sure you have an accurate watch and themometer and you can use the cooking guidelines to get get it right every time. Whether you’re planning on grilling beef, chicken, turkey, pork or seafood this guide has got all your grilling techniques covered. Here’s a look at some fun grilling facts, like you’re not alone if you try and grill year round and if burgers are your all time favourite. These days BBQs aren’t all about the meat. Infact knowing how to grill vegetables to perfection will always please your audience as well as adding colourful and healthy elements to your BBQ. This interesting guide covers off which veggies are made for BBQing as well as those best avoided. Some intersting tips include how to BBQ artichokes and brussel sprouts. Smoking meats adds a wonderful complexity and dimension to the final flavour. This infographichightlights the basics on how to go about achieving those delicious results. If you love BBQ’s you’re not alone, as this infographic shows, most Americans own a grill and use it regularly. See how you stack up in the statistics below.